I'm Mrs. P and student engagement is my prerogative. 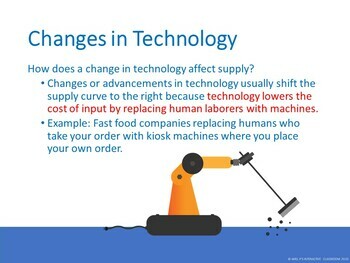 Coming into the supply and demand unit, my students usually think that supply or sellers have nothing to do with them. Well, I love to flip the switch and put them into the seller's shoes. Watching students think, act, and make decisions as a seller makes traditionally dry content absolutely captivating. 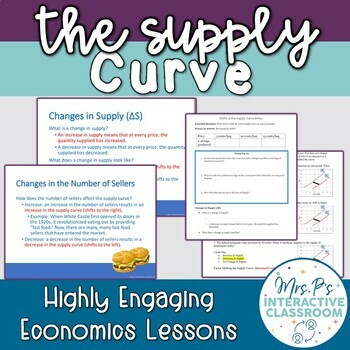 These 2-3 lessons will teach students all about the supply curve. 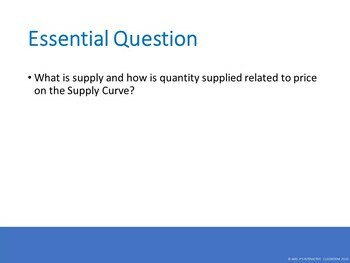 I usually teach these lessons after spending four days covering the demand curve in my Supply and Demand Unit. Along with lecture notes, I've included engaging activities and critical thinking opportunities throughout the lessons as well as plenty of practice for students as they familiarize themselves with these fundamental Economic concepts. I usually teach these lessons in three 50 minute periods, but they can be combined for a block period schedule as well. 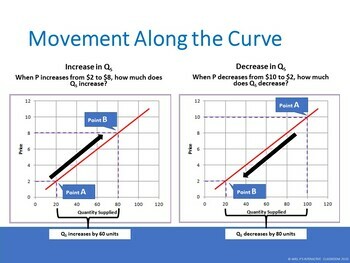 Some worksheets assume that students have already learned about the demand curve.